Vampire hunter Elena Deveraux knows she is the best – but she does not know if even she is good enough for this job. Hired by the dangerously beautiful archangel Raphael, a being so lethal that no mortal wants his attention, Elena knows failure is not an option – even if the task is impossible. The job will put Elena in the midst of a killing spree like no other – and pull her to the razor’s edge of passion. Even if the hunt does not destroy her, succumbing to Raphael’s seductive touch just might for when archangels play, mortals break.. I don’t really read that much paranormal/urban fantasy anymore, but had heard a lot of great things about Nalini Singh’s books. 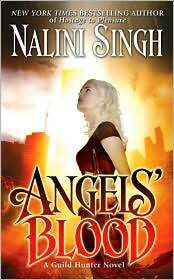 I picked up ANGELS’ BLOOD not really knowing if I would enjoy it or not, but I didn’t just enjoy it – I loved it! The world the book is set in isn’t a happy one, nor one I would ever want to live in, but yet I was drawn to it. The writing completely captivated me. The different take on vampires/angels/and hunters was fresh and just different enough. I will definitely be reading more by this author. If anyone has recommendations, please leave me a comment.